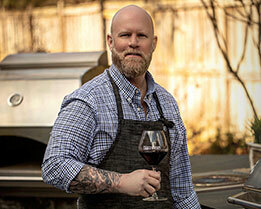 Wood fired ovens are all the rage these days, and for good reason. Not because cooking inside a wood fueled oven adds any flavor (more on that later), but because these units get so hot—much hotter in fact than your indoor oven is capable of. 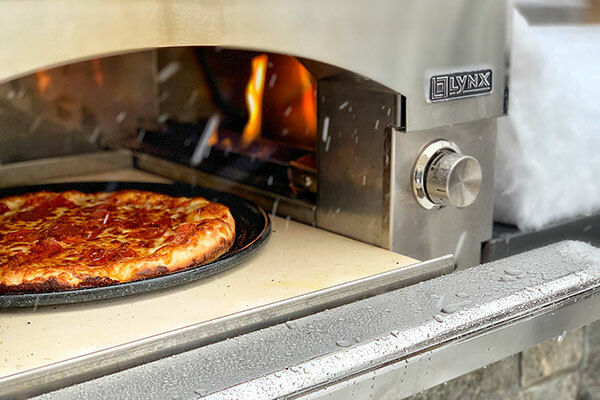 Today, I am reviewing what will undoubtedly be a top pick for outdoor cooking enthusiasts in 2019, the Lynx Napoli Oven. Having used this oven now for about a year, I’ve cooked about everything you can image in this unit, in all types of weather—including snowy winter days. Below are my findings after 60-plus cooks using the natural gas version of this unit. *Specs taken from Lynx Grills website. It would be hard to start this section of the review without talking about the convenience. 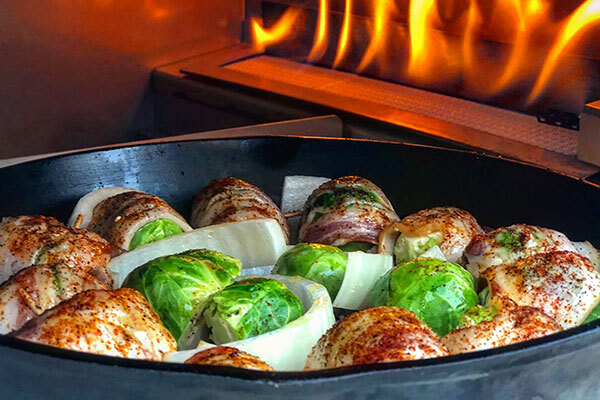 The concept of “wood fired” has gained popularity in recent years and having owned a “wood burning” oven I understand why. 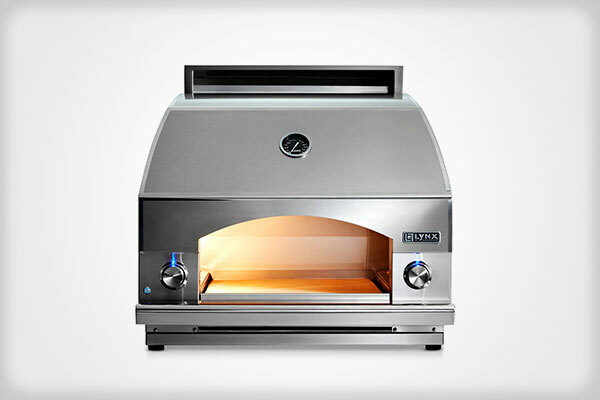 These ovens get much hotter than any indoor oven, which allows for more versatility without heating the entire house. The down sides with true wood burners, however, are numerous and many describe them as being too much effort for use on a regular basis. The wood burners take a long time to heat up when considering the time it takes to get the fire started, etc. (1-2 hours in some cases). The ash clean out after use is a pain in the backside and they use a decent amount of wood during the cooking process. 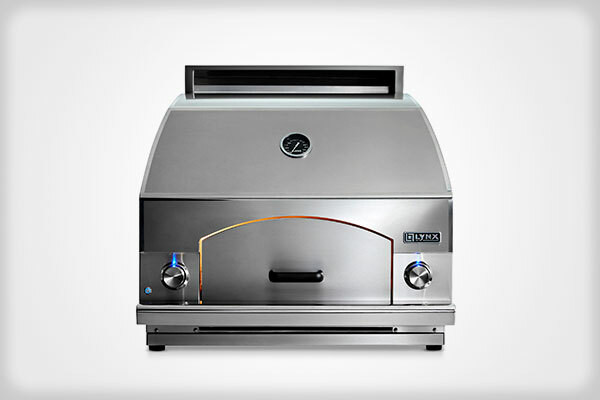 Lynx has solved these issues with their gas version of the ever popular wood fired oven. With the turn of a knob you have a 700°F-plus oven in less than half the time it would take for a wood burner to achieve that temperature. The added bonus is no ash clean up after you cook and you don’t have to constantly feed wood to the fire. I’ve been asked many times if I miss the flavor of the wood burner when I’m making my pizzas so I thought it important to address that here. In short, no. The reality is that for the thing that people cook most often in the oven—pizza—using real wood doesn’t actually impart any flavor at all. The pie is simply not in the oven long enough to take on any of the smoke. Smoke, by the way, should be very minimal inside the oven if the fire is burning properly. Next, I really like the slide out drawer feature on this unit. Wood burners don’t have this, which requires the use of a tool to reach into the oven in order to adjust any food. Lynx has incorporated a drawer into their oven which can be pulled out to allow for easy access to whatever you’re cooking. The drawer also incorporates a removable door which allows the user to watch as their food cooks. This is a super fun feature for entertaining as there just seems to be something mesmerizing about watching food cook, cheese melt, sauces bubble, cookies take shape, etc. In full disclosure, I have not cooked on every make of wood burner—no one has. But, on the ones I have cooked on there’s consistently been an issue with temperature variations at different places inside the oven based on the location of the fire. I don’t get that with the Lynx unit as they’ve located a burner on either side of the oven creating a very consistent temperature throughout the cooking chamber. I found the reversible exhaust duct on top of the oven to be genius. Remember when I said I have used the oven even when it’s snowing? Well reversing the exhaust duct allows for the hot air to be directed away from the user in the summer, and towards the user in the winter when I’m shivering outside using my oven. Now, I don’t know if this is by design, but it’s pretty dang cool nonetheless. 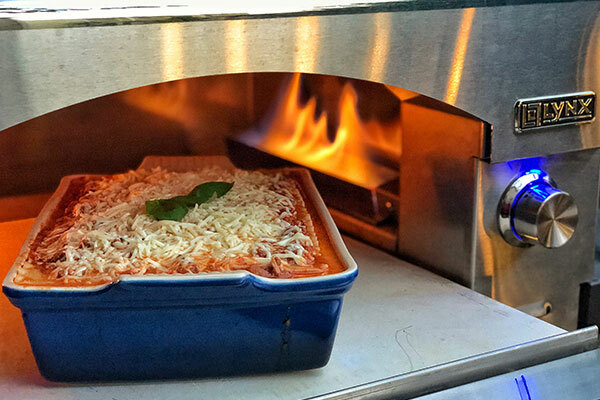 It’s challenging to control lower temperatures in a wood fired unit, and they take a long time to cool down if you overshoot your target temperature. What I love about this unit is that with the turn of a knob I can dial in 325°F for braising a roast, or making some killer steak sliders, bring the temp up to 350°F for things like making lasagna or cookies with my daughter, or crank it to 425°F for roasting veggies, cooking polenta, or crisping some chicken wings. Then of course, there’s full afterburner that produces temps in excess of 700°F for pizzas and flatbreads. The point is, with this oven you’re not limited to just afterburner pizza, the sky’s the limit with what I make in this oven. 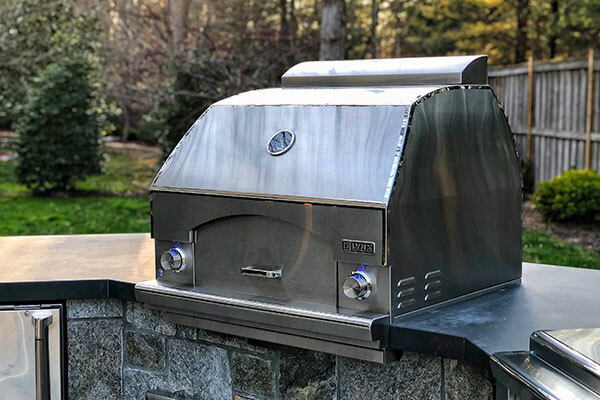 Finally, consistent with the Lynx product line, the 304 stainless and seamless welded construction allow this grill to take a beating from use, the elements, etc. and withstand the test of time. I’ve got to say, (and you’ll know this if you’ve read many of my reviews) it’s not often that I don’t think I could improve on a product—in fact it rarely happens. In this case, I can’t say there’s a single thing that needs to be changed or improved on. Like all Lynx products, this units allows for built in application as well as free standing on a kitchen cart which makes it perfect for those considering an outdoor kitchen or for a deck or patio. It’s simplicity allows for even a novice cook to use it effectively and efficiently. After using a true wood burner for many years, I was skeptical about a gas “wood fired” oven. I was wrong (it happens) and I’m now a convert. In fact, this is one of my most used grills. It wouldn’t be disingenuous to say that I’ve used this unit more in the year or so that I have had it, than I used the wood burner in the several years before it. True wood burners can be fun, but as many (dare I say most?) would agree, the effort and time required to use them results in them going unused the majority of the time. If you know someone with a wood burner, ask them how often they fire it up…if they’re honest, most will tell you a few times per year, max. For me, that’s just not enough use to justify the cost for these ovens or the real estate they take up on a deck or patio. The convenience offered from a gas option allows users the opportunity to use the oven on more than just special occasions; this is truly the daily driver of ovens with the look and options of your Sunday cruiser.